When the wraps finally came off the old Wertheim building on Rosenthaler Straße, it was clear that something abominal had happened. 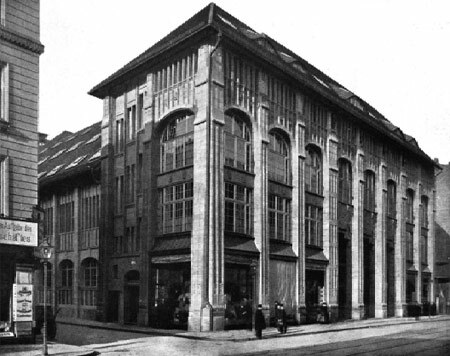 Quietly and discretely, the developers WayssÂ &Â Freytag had mutilated the façade of this historic department store by covering its natural stone structure with sand-stone cladding. No attempt had been made to restore its orignal beauty. A more degrading insult to the original can hardly be imagined. The cladding, a kind of city-wide eczema implemented to suggest ‘authenticity’ in the new, has been used here to conceal genuine authenticity in the old. At street level there seem to be embarrased admissions that something unforgivable has taken place: figurative stone masonry has been laid bare in what looks like a dithering reversal of intent. The effect is brutish rather than curatorial; an admission of sloppy amateurism carried out with breathtaking clumsiness. Making matters worse, the entrance to the building has been adorned with inexplicable steel grates. The structures looks temporary or unfinished and defy obvious explanation. They are too strongly built to be anchors for sheets of glass, which would extend shelter from the rain out over the pavement. And to call them sun-shades would be preposterous: they are too slatted to be effective, and are superfluous since they have been mounted above an entance which is already recessed, and is on the west-facing frontage of a building which looks out over a narrow street. Sun will not be a problem on the ground floor. 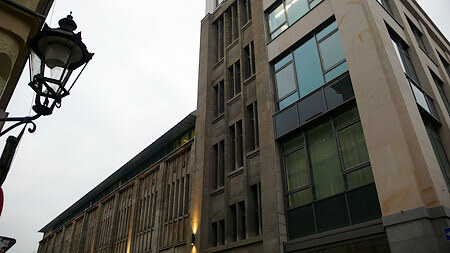 The view above shows the criminal absurdity of the whole endevour: the building looks as though it has been forced to wear a Halloween mask, since everything beyond the main road has actually been reverted to back to the way it was before the building was Â«cleansed of styleÂ» in GDR times. Real substance has been obscured by a shoddy veneer of plastics and fakery. This is not business as usual: this is a truely exceptional case of ineptitude. Here’s a Berliner Morgenpost article from March 2006. 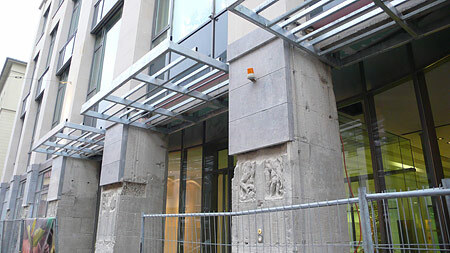 Udo Barske, spokesman for the building’s new tennants, the AOK insurance fund, is quoted as saying: “Because the building is listed, the natural stone façades will be kept in their original state.” This poor guy must still be chewing away on those bitter, bitter words. The final irony must be that the AOK is a fund which provides health insurance. They are now doing this from one of Berlin’s sickest buildings.